It seems that there are a slew of books coming out in recent years about wartime espionage and the characters involved. 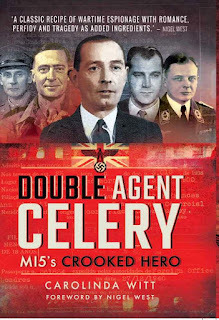 One of the newest, hot off the press books is entitled Double Agent CELERY - MI5s Crooked Hero by Carolinda Witt. It turns out that CELERY, whose real name was Walter Dicketts was quite a character. He had six children via four wives and two mistresses - and none of the children knew of each other. The author of the book is one of his grandchildren who knew nothing about her grandfather until her mother passed away in 2007. Carolinda discovered another Dickett's grandchild on a genealogical forum and began to uncover the unbelievable story of Walter Dicketts. Carolinda's book is being published today, 30 October 2017 (at least in the UK) by Pen & Sword books, with a foreword by Nigel West. The book will only be available in Canada in January 2018, so I will have to be patient. As Britain braced itself for the onslaught of a German invasion in February 1941, MI5 sent a handsome, womanising confidence trickster with a photographic memory, entrepreneurial flair, and nerves of steel to Lisbon to pull off the seemingly impossible. It sounds rather intriguing. 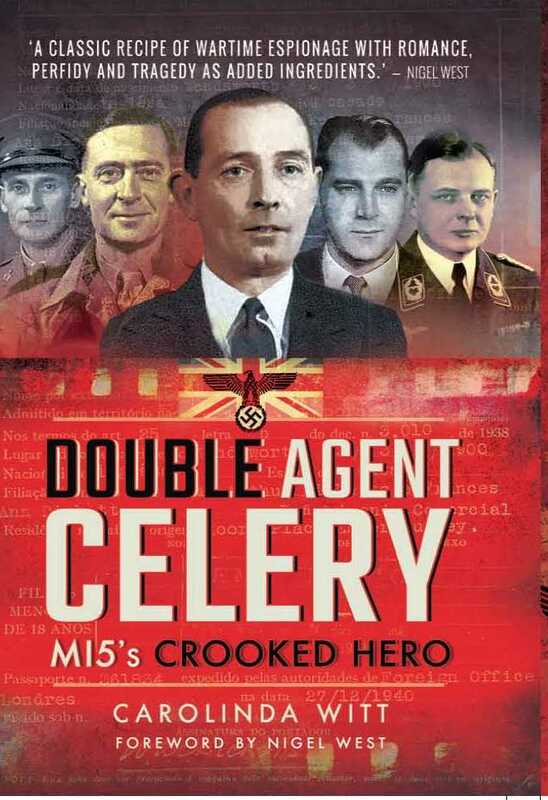 CELERY was involved with SNOW and it was their February 1941 trip to Lisbon that tipped MI5s hand in retiring SNOW from his double agent duties. MI5 was never certain whose side SNOW was on. CELERY was indeed lucky to escape Germany with his life. When the book becomes available over here, I'll post a review after I've read it. Stay tuned. New mysteries always seem to be popping up in the quest for information on Josef Jakobs and the other World War 2 spies who arrived in England on behalf of Germany. The recent interest, both on this blog, and in the news about Engelbertus Fukken (alias Jan Willem Ter Braak) has led me down some interesting byways. Is there a possibility that Jan Willem did get some messages sent to the Germans? When Josef was interrogated at Camp 020, he told the officers that, during his training in Hamburg, in the Fall of 1940, he had been shown some agent messages by Boeckel (alias Dr. BEYER or BRUHNS). Josef said that Boeckel showed him the messages in order to demonstrate how they wanted the messages sent. According to Boeckel, these messages originated with their agents in England and had been sent to Germany via wireless transmitter. Josef recalled the contents of five of those messages and shared them with the Camp 020 officers. Described the industrial buildings and factories in Coventry before the heavy air raid on that town took place. [the worst bombing took place on the evening of 14 November 1940] It was signed "107" [the agent number]. JAKOBS said he particularly remembered this number, because he asked Dr. BEYER at that time how they knew who had sent the message, and Dr. BEYER pointed to the number. He also remembered this message very well because when he saw it the papers were already full of the heavy air raid in Coventry. Apparently sent by a Swede, because it was written partly in English and Swedish. It contained a description of a factory that had recently been built here. The details were so exact that the Germans were able to pick out its position on a map. He could not remember the signature number. Described position of road barricades erected to hinder invaders. He could not remember the signature number. Contained descriptions of an aerodrome, and the message stated that the Germans could not use it because there was some kind of man-trap concealed , which turned over landing aeroplanes. Gave the names of ships lying in a certain dry dock. The names of ships seen on the sailors' caps at this particular port were also given, as the agent assumed that their ships must also be somewhere in the neighbourhood. These messages naturally caused quite a stir at Camp 020 and within the Double-Cross system at large. Did all of these messages match up with MI5s double agents who had been transmitting information to the Germans? 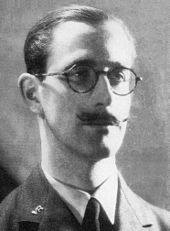 In early July 1941, Flight Lieutenant Charles Cholmondeley (pronounced "Chumley") conducted a thorough search of all the wireless transmissions that had been sent to Germany by MI5's stable of double-agents. Cholmondeley wrote a report which stated that, "having checked over the traffic, I find that we have no claim to Nos. 1 and 4. However 2, 3 and 5 may possibly have emanated from SUMMER and TATE". Before we get into the three messages that Cholmondeley connected to SUMMER and TATE, it is helpful to remember that SUMMER (the Swede, Gosta Caroli) landed in the Northampton area and that, had he evaded capture, he was assigned to work in that general area. In his early transmission career with MI5, he transmitted from Aylesbury and later, from Hinxton Grange. 2. Apparently sent by a Swede, because it was written partly in English and Swedish. It contained a description of a factory that had recently been built here. The details were so exact that the Germans were able to pick out its position on a map. He could not remember the signature number. "Grantham Aerodrome is situated 2 km. south-east of the town, just before the road fork to Donnington. [Indeed it was. One can still see vague outlines of the airfield on Google satellite view.] It is built on top of a hill. It is said that it is invisible from 1000 m. up. There is one large and two small hangers 150 m. from the road. Entrances towards SSW adjoining NE of these are 6 hangars with entrances to the SSE. The landing field extends 1 km to the next cross-roads. 41 training planes and 5 Spitfires on field. No guards visible. Light Flak. NNE corner of the aerodrome." 5. Gave the names of ships lying in a certain dry dock. The names of ships seen on the sailors' caps at this particular port were also given, as the agent assumed that their ships must also be somewhere in the neighbourhood. "Liverpool. In the town saw many sailors from HMS Sandwich [a Bridgewater class sloop launched in 1928] also from HMS Vernon [either a mine-laying tender HMS Skylark renamed Vernon in 1938 or the Navy's shore-based torpedo school called HMS Vernon] and HMS Australia [can't find a WW2 ship of that name - HMAS Australia commissioned 1911 was scuttled in 1924]. Heavy AA reported to be mounted on many ships in port. and his transmissions. Top left marker is Liverpool. Cluster of markers along mid-right is Grantham area. site. (Blue markers are landing sites of other spies). While the November transmission about Grantham makes sense and falls within the time frame where Josef would have been at Hamburg for training, the message about Liverpool is a bit of a stretch. Josef told the interrogators that he went home for Christmas and he only spent a few days in Hamburg in early January before being sent on to The Hague. In addition, Josef said that the first message, about the bombing in Coventry, stuck in his mind as the newspapers were full of details about the bombing. This would suggest Josef saw the messages after mid-November, but within a week or two of the Coventry bombing (November 14, 1940). A message sent by SUMMER on December 24 does not fit these parameters. 3. Described position of road barricades erected to hinder invaders. He could not remember the signature number. Cholmondeley found a series of messages, dated late October to early November which could correspond with the message Josef had seen. The maps below shows the main points described in the six transmissions (TATE is reddish markers, SUMMER is orange markers). The cluster from SUMMER are for an area between London and Oxford. The cluster from TATE center on an area north of London, near Hendon, coincidentally very close to Karel Richter's landing site (blue marker). "Road blocks on all approached [approaches] to Thame. Searchlight and machine guns 5 km on the Thame-Aylesbury road near railway viaduct. Nearby in large field many obsolete cars to prevent landing. Strong road obstructions and tank stops of steel girders 2 km from Aylesbury and 400 m behind it there is a gun emplacement. I did not see any new airfields on the way. "Main road between High Wycombe and Princes Risborough 1.5 km from Wycombe near the railway bridge, just past the fork to Oxford is a moveable barbed wire barrier. After passing the "Red Lion" at Bradenham there is, on the right side of the road, what I believe is as light A.A. gun emplacement. Close observation is not possible as there is a guard in the block house, but it looks as if a number of these emplacements extend round the hill on the right side of the road. On the road round the hill to Lacy Green and Speck (Speek)? I could see further road obstacles and gun emplacements. Locations described in messages of TATE and SUMMER. TATE messages are red/purple markers. SUMMER messages are orange markers. Blue marker is Karel Richter's landing site. "Details of locality refer to a journey along the main road from Thame to Aylesbury". TATE also reported on similar blockades, tank traps and pill boxes in a series of messages about the Hatfield/Hendon area north of London.TATE was ostensibly based in a rooming house in Barnett, so this makes sense. "Barnett by-pass plane traps every 250 km. Barricades every 1.5 km usually old motor cars and barbed wire. Pillboxes at roundabouts. Pillbox junction Barnet Road and by-pass 2 km S. Hatfield aerodrome camouflaged represent advertising kiosk. Rumour new night flying bomber crew 6 or 7 and super armament. "Tank traps on all main roads leading to Bignells Corner on Barnet by-pass also one pillbox commanding these four roads. All roads to Hatfield aerodrome are partly blocked and all fields within about 5 km round have wire traps across them." Cholmondeley concluded that "in the case of (2) and (5), I feel the evidence is fairly good and leads definitively to the supposition that the messages were those sent by SUMMER, since JAKOBS particularly noted that in (2) the message was apparently sent by a Swede and in (5) there is direct reference to sailors' caps." Cholmondeley did not apparently feel that message (3) matched any particular SUMMER or TATE message exactly. Major Thomas A. Robertson, the head of MI5's Double Cross system sent Cholmondeley's report on to Major Stephens at Camp 020. Robertson noted that while Cholmondeley thought that Messages 2, 3 and 5 could have emanated from SUMMER or TATE, Message 2 was problematic. SUMMER apparently transmitted in German and yet Josef had said that the message was a mixture of Swedish and English. Gosta Caroli (SUMMER) was Swedish so... not outside the realm of possibility but... he only transmitted in German, according to MI5. Regarding Message 5, the report from Liverpool, Robertson noted that Josef referred to sailor's caps which also occurred in SUMMER's message. This is a bit of a conundrum, since SUMMER's message, as contained with Cholmondeley's report, makes no mention of sailor's caps. WW2 Sailor's cap with HMS tally. 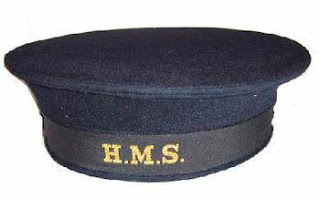 Interestingly, while some of the tallies (ribbons or bands) around sailors' caps had "HMS Ship's Name" on them, others simply said "HMS". This was a wartime security precaution - an attempt to confound German agents or sympathizers. Strange that MI5 would have sent such a message to the Germans. Unless, of course, British sailors, safe in a British port, were permitted to wear tallies with their ship's name. So, we have five messages, two of which likely emanated from SUMMER or TATE and three which have no known double-agent source. Message 1 - a message that described industrial buildings and factories in Coventry prior to November 14, 1940. Josef saw this message after November 14 but the news of the Coventry bombing was still fresh in the papers. MI5 admitted that this message had no known connection to any Double Agent transmissions. Message 2 - sent in a mixture of Swedish and English - likely from SUMMER about his visit to Grantham (although CELERY went in early November too). Message 3 - a fairly generic message about road barricades - likely emanated from either SUMMER or TATE. Message 4 - a message describing an aerodrome with man traps to prevent the landing of German aircraft. MI5 admitted that this message had no known connection to any Double Agent transmissions. Message 5 - a message about ships in dry dock and ship names on sailor's caps - MI5 thought this might be a SUMMER transmission from 24 December 1940 but, as mentioned above, it is unlikely Josef would have seen this particular transmission. He likely saw all five messages in mid to late November in Hamburg. Which means that this particular message is also not connected to a known agent transmission. MI5 didn't do a very good search of their double-agent transmissions and missed the ones that would match 1, 4 and 5. Messages 1, 4 and 5 may have originated with Juan Pujol Garcia (later double agent GARBO). Garcia got himself recruited as a German spy and while supposedly based in England, was actually living in Lisbon. Using newspapers and travel books, Garcia sent bogus reports to Germany about his "spying" in England, without ever leaving the comforts of his Iberian home. His messages were so accurate that when MI5 learned of them, they panicked and thought there was a spy on the loose in England. Garcia used secret ink, not wireless transmissions - so he is an unlikely candidate. Messages 1, 4 and 5 may have originated with a German spy unknown to MI5 - perish the thought. MI5 was quite confident, in late 1940 and early 1941, that they had scooped up all... or rather... most of the German agents. There was the notable exception of Engelbertus Fukken (Jan Willem Ter Braak) who landed near Milton Keynes in early November 1940. MI5 did discover his parachute, which he stuffed in a hedgerow rather than buried, and knew that at least one spy had eluded their clutches. Fukken settled in Cambridge and remained at large until committing suicide in an air raid shelter in late March 1941. Upon discovering his wireless transmitter, MI5 couldn't decide if he had managed to successfully contact the Germans, or not. Could Messages 1, 4 and 5 have emanated from Fukken? The timeline would be about right, although he would have had to travel from Cambridge to Coventry within a few weeks of landing. Not outside the realm of possibility. On the other hand... if one spy eluded capture, could there be another? Fukken committed suicide in a very public location, with his wireless transmitter conveniently deposited at Cambridge railway station's Left Luggage counter. Could another spy have evaded MI5s capture and then committed suicide in a far less public location? There is always the intriguing Trow Ghyll skeleton mystery which leaves one wondering. While Yorkshire is quite a ways from Coventry and the normal stomping grounds of Germany's spies... one does wonder. There is also the case of the Spy in the Attic, near Liverpool. Perhaps the messages originated from a British-born spy, someone who didn't need to parachute into England and risk capture. Perhaps some Nazi-sympathizer had a secret wireless transmitter with which they sent messages to Germany. This is a bit of a stretch and raises many questions. Where would the transmitter have come from? How would the Germans know on which frequency to listen for the transmissions? What sort of code would the agent have used that was known to both him/her and the Germans? Which leads us to Double Agent, or is it Triple Agent or Quadruple Agent, SNOW, a Welshman who had been recruited by the German Abwehr and then MI5 and then the Abwehr... SNOW was a difficult agent to manage, for both sides. MI5 and the Abwehr always had doubts about whose side SNOW was really on... although some have said that SNOW was always on the side of SNOW! Could SNOW have sent some clandestine messages without MI5's knowledge? CELERY (Walter Dicketts) was of the firm opinion that SNOW had another line of communication with the Abwehr (other than the wireless sanctioned by MI5 (West & Madoc, p.108). In March 1941, after SNOW's trip to Lisbon, MI5 considered the possibility that he was communicating with the Abwehr via a means of which MI5 was unaware (West & Madoc, p. 168). It thus isn't outside the realm of possibility. Another unsolved mystery, and one that likely haunted MI5 as well. At least two, and likely three of the messages, seen by Josef could not be traced to any known Double Agent. Who could have sent those messages? Were they from Engelbertus Fukken? SNOW? Or another, undiscovered German agent? One last caveat is in order... this is all based on the assumption that Josef was telling the truth - something that is hard to establish with any degree of certainty. But if he did tell the truth, we have an intriguing mystery. SNOW - Nigel West & Robert Madoc - p. 107-108, 168. Double Agent Snow - James Hayward. A few weeks ago, I had a question from one of the readers of this blog. The reader wanted to know why I never talk about Josef Jakobs being Jewish. That is actually a very good question! And one that I hope to answer in this blog. The idea that Josef was Jewish originated during his statement at his court martial on August 4th and 5th. Before Josef even reached the stand, his attorney, White was cross-examining Lt. Col. William Edward Hinchley Cooke. White asked Hinchley-Cooke if he knew that Josef was of Jewish origin, Hinchley-Cooke said “No.” White then said that the name “Jakobs” was, of course, Jewish, but Hinchley-Cooke said “Not necessarily.” He said that while some Jakobs’ were Jews, he had met others who were Christians. White said that the accused’s grandfather was a Jew and that his grandmother was a Christian, and his parents were Christian, but that he did have a Jewish strand. White asked if the fact that the accused’s grandfather was a Jew would make him non-Aryan in the eyes of the Nazis, but Hinchley-Cooke said not necessarily, otherwise, the accused would not have been promoted to a commissioned officer in the Great War. If he was Jewish, and if the Germans knew that he was of Jewish descent, then he would not have been given the commission in the 4th Foot Guards. When pressed, Hinchley-Cooke acknowledged that it might have happened, but it would have been unusual, as even during the Great War, the Germans were very strict with Jews. 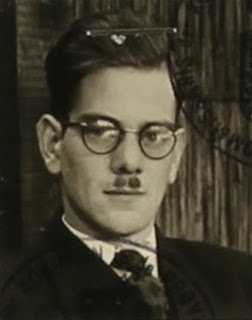 When Josef was brought before the court to be questioned, he stated that he was not a member of the Nazi Party and, according to the Nuremberg Law, would be considered a non-Aryan because his grandfather was a Jew. His grandmother was a Christian, as was his mother, and he himself was Roman Catholic. He also referenced the fact that his father-in-law was Jewish. The prosecuting attorney, A.A.H. Marlowe cross-examined Josef about his family. Josef acknowledged that he was married with three children and that his wife was not a Nazi, and that she had a Jewish step-father. Note that in one instance, Josef says his "father-in-law" was Jewish and in another instance he has a "Jewish step-father". Given that there was a translator and a transcriptionist involved, this is likely a miscommunication. In actual fact, Josef's step-father-in-law (his wife's step-father) was Jewish. Perhaps the most important thing of all is that he is a Roman Catholic. I submit this detail has a ring of truth. He said that one of his objections to the Nazis was that he could not take his children to Church on Sunday mornings and that they had to go shooting. We all know the importance which the Roman Catholic attaches to the upbringing of his children. Does not that bear a ring of truth? Why invent that of all things ‘I cannot take my children to Church’. He is a non-Aryan. The whole story is full of Jews. His wife’s father-in-law, his own father [The transcript says “his wife’s father-in-law, his own father” but this could be a mistake by White or a mistake by the transcriptionist. In actual fact, it was his wife’s step-father which would have been Josef’s step-father-in-law who was Jewish. Josef never claimed that his "father" was Jewish. ], his business associates, and the man with whom he was landed in prison in Switzerland. It is a Jewish circle. It does not require any evidence placed before this Court to tell you that the Jews hate the Nazis. It does not require any stretch of imagination to imagine a man of Jewish origin should have every reason to detest the members of that party. As White noted earlier... Josef's story has a lot of Jewish threads running through it. In the early 1930s, he worked for a Jewish publishing house and later invested money with a Jewish stockbroker. In the mid-1930s, he and a Jewish man ran a gold counterfeiting operation in Switzerland... and spent time in prison there after being caught. In the late 1930s, Josef became involved in a black market venture that sold foreign passports to desperate Jews in Berlin... and he spent time in a concentration camp after being caught. Apparently, it was even a Jewish friend who suggested that Josef join the Abwehr. His wife's step-father was Jewish. Finally, he claimed that his grand-father was Jewish. This was an intriguing claim given that in all his previous statements to MI5, he never once played the "I'm Jewish" or "I'm not an Aryan" card. He always stated that he was a Roman Catholic. He was carrying a Catholic badge when he was first captured. In the days before his court martial, he requested that he be visited by a Catholic priest. He was ultimately buried in a Catholic cemetery. The court martial was the first time where Josef indicated that he might have Jewish blood in him. Was this the claim of a desperate man seeking to win the sympathy of the court martial tribunal? Possibly. 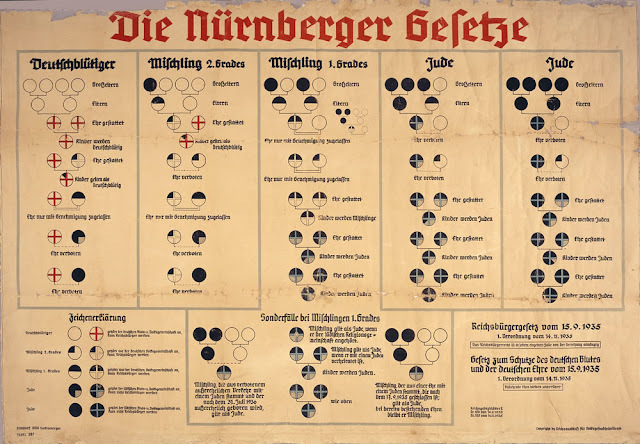 Before we look at the validity of his claim, we need to take a look at the Nuremberg Laws that determined who was considered Jewish and who was considered Aryan in Nazi Germany. On September 15, 1935, the Nazi party passed two laws that would alter the face of Germany: Law for the Protection of German Blood & Honour and Reich Citizenship Law. According to the ideology of the Nazi party, racial purity was of critical importance for the future of the German nation. The Jewish race was seen as inferior to the Aryan race and needed to be expunged. The problem was... how did one determine who was Jewish and who was Aryan? Over the centuries, Jews had integrated into German society. Some no longer practiced Judaism, others had married Christians or even converted to Christianity. To complicate matters, the Nazi party rejected the traditional idea that Jews were defined as members of a religious or cultural community. According to the Nazis, Jews were a race of people defined by birth and blood, even though there was no scientific basis for such a definition. So how to define a Jew? 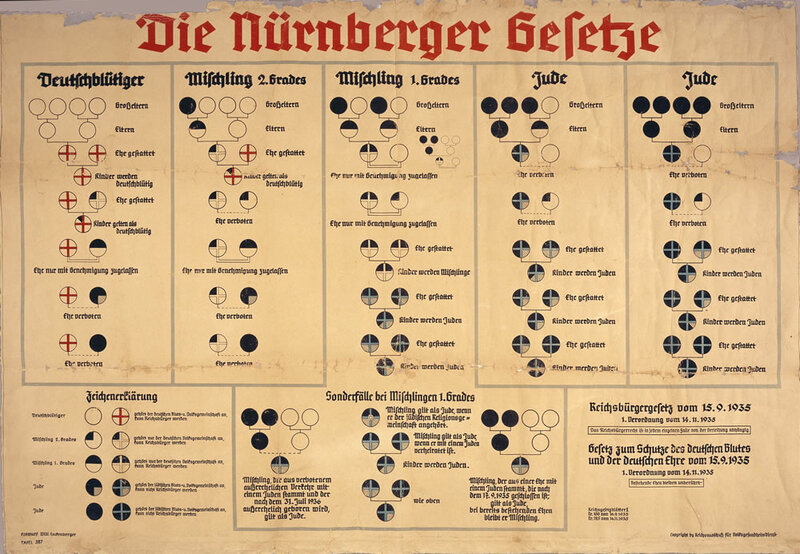 The legislators of the Nazi party decided to use family genealogy to define race. They would look at the grandparents of an individual. Some hard-core Nazis wanted to go even farther back, up to the great-grandparents or great-great grandparents, but more moderate Nazis prevailed. Individuals with three or more grandparents born into the Jewish religious community were considered to be Jews by law. Their grandparents, born into a Jewish religious community, were considered to be "racially" Jewish. Their "racial" status was passed on to their children and grandchildren. This despite the fact that the Nazis ostensibly claimed to reject a racial definition based on religion. But they had to start somewhere... so it started with the grandparents. Under the Reich Citizenship Law, Jews (those individuals with 3 or 4 Jewish grandparents) were not citizens but simply "subjects of the state". This law impacted tens of thousands of people who did not consider themselves Jewish and who might have no religious or cultural connections to the Jewish community. Even those people whose grandparents or parents converted from Judaism to Christianity could be considered Jewish. From one day to the next, these people were stripped of their citizenship and deprived of basic rights. According to Hitler, when someone was more than 50 percent Jewish, they were beyond the point of saving and were evil. While Mischlings (half-breeds) were not considered full-Jews, they still had certain rights curtailed, primarily whom they could marry. They could also be tipped into the "Jewish" category if they belonged to the Jewish religion or were married to a Jew. Even a Mischling of the 2nd Degree, if they looked or behaved Jewish, could be treated like a Jew and deported to a concentration camp. Interestingly enough, Hitler made sure that the legal definition of "Jewishness" excluded Jesus Christ and himself. While there was no concrete proof that Hitler was Jewish, his father was illegitimate and Hitler wanted to cover all of his bases. If a Jewish person had married an Aryan person prior to September 15, 1935, they were afforded some protection and many were able to escape being sent to the concentration camps. These laws generated a huge upsurge in genealogical research in Germany. All of a sudden, one needed to be able to prove one's non-Jewish ancestry, at least up to the grandparent level. Church offices and courthouses saw a huge upsurge in people requesting their ancestral birth, baptismal, marriage, death and burial records. One can only imagine the anxiety with which people awaited the results of their ancestral lineage. It literally could mean the difference between life and death. If we return to Josef and his claim that one of his grandparents was Jewish, we now see that he would have been classified as a Mischling (half-breed) 2nd Degree. He was also a staunch Roman Catholic and it is unlikely that he would have been considered to "look" or "behave" like a Jew. Although... given his continuous brushes with the law, one could wonder if he would have been labelled "undesirable" from that perspective. Ultimately, the real question is... was one of his grandparents Jewish? Detailed genealogical research by the author has uncovered an unbroken series of Catholic baptisms/marriages/burials in Josef's ancestral lineage, well into the 1600s. Josef's claim that one of his grandparents was Jewish is false. In all likelihood, he was playing the Jewish card in a bid to garner some sympathy at the court martial. The claim that Josef Jakobs was Jewish is not accurate. This claim does not appear often in the literature and I am only aware of the 1999 article by the Jerusalem Post which claimed that Josef was Jewish. It is interesting that some articles will claim that Josef was Jewish while others will claim that he was an agent for the Gestapo. From one extreme to the other. Josef was neither Jewish nor a member of the Nazi Party's Secret State Police (Gestapo - Geheime Staatspolizei). He was an unlucky family man caught in the cogs of war. Josef Jakobs Court-Martial File – August 4, 1941. Jewish Virtual Library - Was Hitler Jewish? In the English Midlands in the 1940s, there were two very creepy unsolved murders: in one, a woman's skeleton was found stuffed inside a wych-elm tree, and in the other, an old farmer was murdered in broad daylight by having his throat slashed and his body pinned to the ground by a pitchfork. Neither of the killers was ever caught, and in fact, the identity of the woman found in the wych-elm is still unknown. Eerily, both cases had details that suggested that they could possibly have been occult related. Were these killings part of some weird black magic rite? 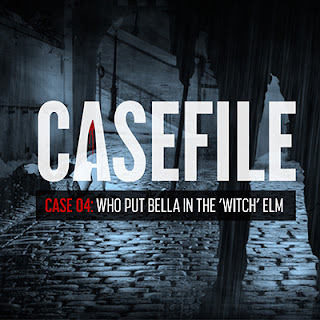 On this episode, Tom and Jenny discuss two infamous unsolved murders: the case known as Who Put Bella in the Wych Elm, and the Charles Walton Pitchfork Murder. Along the way, we also discuss legends about witchcraft in rural England, as well as the possible Nazi spy connection of the mysterious Bella skeleton. Put on your goat's head and light a few black candles, because episode 49 of the 13 O'Clock Podcast has just been summoned from the underworld. I started listening and the first four minutes were a discussion between the hosts in which they shared how they split their 13 O'Clock channel from Project Entertainment Network and were going out on their own. Then there was an intro to the Murder by Witchcraft piece followed by another discussion from the hosts about supporting their podcast channel on Patreon. I get it... posting stuff for free is draining on time and the pocketbook (impatient drumming of fingers on desk whilst waiting for actual content). We finally get to some substantial content at 11:30 minutes into the show (in case you want to skip the promotional plugs). The topic of the show is two murders in the 1940s that happened within 50 kilometres of each other and were both linked to witchcraft. Jenny researched the Bella in the Wych Elm case for her book (Faceless Villain). While the show is on YouTube, it is primarily an audio podcast but they do include some still photographs, both generic images which have nothing to do with either case and some from the actual Bella and Walton cases. Like most double-host podcasts, there is a fair bit of interplay between the two hosts where Jenny tells the story and Tom interrupts with questions. The telling of the story follows the usual path, four boys poaching for bird's eggs in Hagley Wood. They found a skeleton in a hollow Wych Elm tree. The police were called and discovered that the tree contained an entire skeleton, except for a hand, which was found outside the tree in some underbrush. Folklorist Margaret Murray focused on the separate hand which might imply witchcraft - Hand of Glory, etc. In 1953, Una Mossop wrote a letter saying her husband, Jack Mossop had worked in a munitions factory during the war. Jack had known a Dutch man who was a Nazi spy. Jack said that after a night at the pub, he saw the the Dutch man strangle a Dutch woman and that they then stuffed the woman into a tree in Hagley Wood. Jack later died in an insane asylum haunted by images of a woman in a tree. While the hosts admit that the Nazi spy angle doesn't have a lot of evidence to support it, to them, it seems like the more likely scenario (as opposed to witchcraft). The hosts then tell the story of Charles Walton (a.k.a. The Pitchfork Murder). Much of their information is based on Donald McCormick's book which, as noted above, is more imaginative historical fiction than anything based in fact. Not the most well-researched account of Bella in the Wych Elm. I've noted some of the issues above. If you want to listen to a well-researched and entertaining podcast, I highly recommend the Thinking Sideways podcast. I wrote a review of that podcast in April 2017 and you can read that blog here. I hit the jackpot a few weeks ago in the case of Clara Bauerle. At least... I think it's a jackpot. I was doing a search on Ancestry for Clara's name, something that I do on a fairly regular basis. New documents are always being digitized and I cycle through some of the key names, just to see what else might show up. Well... there was a hit from a genealogical research source called the Lutheran/Evangelical Wurttemberg Family Tables. These are similar to what the Roman Catholic church calls Family Books. Each family in that parish or church gets a page on which are recorded the birth, marriage and death information for the father and mother, grandparents as well as all of the children. Adolf and Dorothea were married on 15 October 1891 in what looks like Zurich (presumably Switzerland). Given that their first child was born seven months earlier... in March 1891... one can perhaps imagine why they may have seen fit to be married in another country, far from the prying eyes of neighbours and church congregations. These are the same parents who were listed on Clara Bauerle's death registration from December 16, 1942, in Berlin. Which leads us to the children of Adolf and Dorothea. Adolf Friedrich Wilhelm Bauerle - born 17 March 1891 in Dettingen (his mother's home town). The family table notes that he "fell" (in battle) on 2 August 1917. The German War Casualty list from 22 September, 1917, notes - Adolf Bauerle, unteroffizier (Non-Commissioned Officer) born March 17 in Dettingen, living in Kirchheim, died. The German War Graves Commission lists an Adolf Bäuerle, unteroffizier, who died on 2 August, 1917. Adolf is buried at the German War Cemetery in Selvigny, Block 1, Grave 388. This was Clara's eldest brother and he died when she was 11 years old. Anna Bauerle - born on 12 September 1892 in Langenau (just outside Ulm); died 10 July 1893 in Dettingen - less than 1 year old. Dorothea Anna Bauerle - born on 12 July 1895 in Ulm; died 10 August 1895 in Ulm - just over 1 year old. stillborn Bauerle - stillbirth on 3 February 1897 in Ulm. 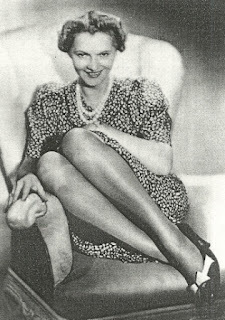 Hedwig Klara Bauerle - born on 27 August, 1905 in Ulm (our Clara). stillborn Bauerle - stillbirth on 12 December 1907 in Ulm. Christian Willy Bauerle - born on 18 November 1898 in Neu-Ulm. Out of seven children, two were stillbirths, two died around one year old, and one died in World War I. Which leaves us with Clara and her brother Christian Willy (Wilhelm or William). While we know what happened to Clara, what became of her older brother? Christian Wilhelm Bauerle immigrated to the United States of America in the mid 1920s. He applied for Naturalization in 1927 in Philadelphia, Pennsylvania. That same year, on June 19, he married Else (or Elsie) Luise Krimmer (from Ludwigsburg, near Stuttgart) in Germantown, Philadelphia. Elsie had come over to the United States in 1923. In 1928, a daughter was born to the young newly-weds, Clara (Claire) E. Bauerle. Christian, who preferred to go by William, was a painter by trade and the family lived at 255 Berkley Street in the Germantown district of Philadelphia. In 1937, another daughter was born to them, Barbara Rosine Bauerle. In 1942, William was called up for the World War 2 draft, although there is no record that he served in the military. William's wife, Elsie, passed away in 1950 from chronic myocardial degeneration due to coronary sclerosis as a result of obesity. She is buried at the Hillside Cemetery in Rosyln, Montgomery County, Pennsylvania in plot 397 of the German Lutheran section. A few years later, Claire would join her. Claire married James F. Spraker in 1953 in Germantown, Philadelphia but passed away just over a year later, on August 5, 1954. She died of renal failure due to nephrosis (kidney disease). She too was buried at Hillside Cemetery. That same year, in November, William married Wally Herta Gottschalk (born in Berlin, Germany). A few years later, in 1957, William's youngest daughter, Barbara, married Russell Howell Bell in Germantown, Philadelphia. William passed away in October 1965 in Philadelphia. His burial place is unknown, although Hillside Cemetery seems likely. The trail of the expat Bauerle clan grows a little hazy but it would appear that Barbara and Russell had three sons - Gary, Greg and Scott. It would also appear that the couple either got divorced or that Barbara passed away, for Russell later remarried a woman named Dorie (Doris). Russell apparently passed away in 2014 in Florida and was buried in the Sarasota National Cemetery (he had served in the US Navy for 4 years as a YNT2 - Yeoman Typist Second Class). One does wonder if William Christian Bauerle's daughters had any idea that their Aunt Clara, the (semi-)famous singer, would later be revealed as the acquaintance of a German spy? Or that she flirted with serving in the German Abwehr? Or that she had a passing connection to the Bella in the Wych Elm mystery? Perhaps the family papers have some old letters from Clara to her American relatives? Claire would have been 14 years old when Aunt Clara passed away in Berlin and Barbara would have been only 5 years old. Perhaps the family papers also contain photographs of the Bauerle parents - Adolf and Dorothea Barbara? I'm always amazed at how far this blog travels so... we'll see. There is one oddity in the Family Table listed above. All of the children are listed in chronological order of birth with the exception of Christian Wilhelm. He was born in 1898 and yet he is the last one on the list, after the last stillbirth in 1907. Two possibilities suggest themselves. He was forgotten when the list was first drawn up and added at the end. The handwriting looks identical for the entire page so this seems most likely. The other possibility is that he was added to the family later, perhaps as an adoption or a nephew. Given that the entire document is written in the same hand, including the death of the mother in 1941, it would suggest that this document was drawn up after that time. Was it a transcription error or was Christian added at the end because he joined the family after 1907. Rather hard to say but an intriguing oddity. Ancestry - genealogy site - births, marriages, deaths, US census records (1930 & 1940). 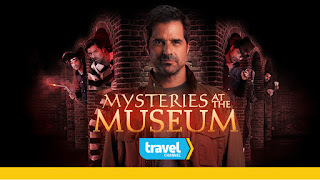 Last summer (2016), I was contacted by the archivist for the Mysteries at the Museum TV show that airs on the Travel Channel. The archivist said that they were doing an episode on the Woman in the Wych Elm (Bella in the Wych Elm) and wanted to know if I could send them a high-resolution photograph of Josef to use on the show. I sent them a photo and asked for a copy of the episode in return. In November 2016, I received a DVD from Optomen that contained Episode 8 of Season 12 of the series. The episode was entitled Blowing up the House, Beast of Bray Road and the Discovery of Penicillin. This was a little confusing as these were only the first three stories of that episode. The story of Bella was fourth. The premise of the TV series centres on various artifacts, found in museums around the world, and the stories behind them. The producers of the show use actors to recreate historic events as well as archival footage and images to help bolster the stories. Sounds rather intriguing. The Woman in the Wych Elm story starts at the True Crime Museum in Hastings, England. The museum is relatively new (open two years) and is touted as a "chilling but fascinating insight into the world of Serial Killers, Forensics, Gangsters, Prisoners, Poisoners and more!" It houses the largest collection of crime memorabilia in the UK in a series of seafront caves which lend it an eerie atmosphere. You can apparently see a "GENUINE lethal injection deathbed" and the "ACTUAL acid containers used by John George Haigh to dissolve his victims." Gruesome! Ich bin heute ja so verliebt - Claire Bauerle. Which makes the artifact that introduces the segment seem even more innocuous than usual - a 10" gramophone record. The curator of the museum, Joel Griggs, describes the record and then states that it "might hold the key to unraveling one of the most compelling murder mysteries of war-time Britain". Fascinating! We are then taken on a quick tour of the background story - in 1943, some boys find the skeletal remains of an adult human being in a hollow tree. The victim is found to be a woman, 35 years old, who died 18 months previously. She had a piece of taffeta wedged in her throat and the coroner concluded that she had been murdered. The police combed through missing persons cases with no luck. They commissioned a forensic artist to create a sketch of the woman but no one came forward to identify her. Seventy years later however, an incredible discovery "sheds new light on the story". The incredible discovery turns out to be British newspaper reporter, Allison Vale, combing through declassified wartime files and coming upon some startling information. Apparently, Worcestershire was home to a Nazi spy ring. According to the show, this was quite understandable given that it contained "some very serious Nazi targets" such as munitions factories. In late 1941, British Intelligence received a tip that a female Nazi agent was due to parachute into the area to join the spy ring. The female spy never arrived and many assumed that the mission was aborted and that she never left Germany. According to the files that Allison Vale found, the female spy was thought to be famous German cabaret singer Clara Bauerle. She had apparently been associated with some very senior Nazi officials and was recruited as a Nazi agent. According to Vale, Bauerle mysteriously disappeared from public life in the early 1940s and was never heard from again. Her last stage performance and recordings were in 1941, "around the same time that a woman's remains were found in an elm tree in Worcestershire". Vale suspected that they were one and the same. So, the theory is that in 1941, Bauerle "parachuted into England to join the spy ring but, for some unknown reasons, ran afoul of them and they killed her and dumped her body in the tree." "In the absence of any other definitive theories, many believe her [Vale's] scenario to be true". There is another short piece at the very end of the episode which notes the graffiti found on the public monuments around Worcestershire, "Who put Bella in the Wych Elm". Was Bella a prostitute killed by an angry client, a witch or Clara Bauerle? "Without any solid evidence, the case remains unsolved and a mystery to this very day." Trying to tell the story of Bella in the Wych Elm in five to seven minutes is a bit of a daunting task, no doubt about it. It would be hoped that the producers would have at least attempted to convey factual information but perhaps TV shows are not so much about accuracy as they are about entertainment. Some of the inaccuracies stem from Vale's original article which stretched the facts until they squeaked. Other inaccuracies in the show are just sloppy mistakes. Worcestershire was home to a Nazi spy ring - there is no evidence of this that I have come across in my years of research. MI5 was quite confident that they had captured all of the spies who attempted to infiltrate the United Kingdom. Very unlikely that there was an actual spy ring operating undetected in Worcestershire and Josef Jakobs made no such reference. This particular rumour can be laid at the door of Donald McCormick, a "history" writer who often strayed far from the facts and wandered into fantasy. It is unfortunate that his theories are constantly being reintroduced into the conversation around Bella in the Wych Elm. In late 1941, British Intelligence received a tip that a female Nazi agent was due to parachute into the area to join the spy ring. - I suppose July 1941 technically qualifies as "late 1941". This was when Josef let slip that Clara Bauerle was also being considered by the Abwehr for a mission to England. There is no evidence that she was destined to join a spy ring of any sort. Josef also indicated that since the Abwehr had had no contact with him, it was highly unlikely that she would be dispatched to England. She had apparently been associated with some very senior Nazi officials and was recruited as a Nazi agent. - She had been associated with mid-level Abwehr officials who were most likely ardent anti-Nazis. She was being considered as an Abwehr agent, not as a Nazi agent. "Nazi" refers to supporters of the Nazi political party. Not all Germans were Nazis. Nor were all Nazis Germans. Bauerle mysteriously disappeared from public life in the early 1940s and was never heard from again. - This is because she died of Veronal poisoning in Berlin on 16 December, 1942, not because she parachuted into England and was stuffed into a tree. Her last stage performance and recordings were in 1941, "around the same time that a woman's remains were found in an elm tree in Worcestershire". No, the woman's remains were found in an elm tree in Worcestershire in 1943, not in 1941. It is true that the case remains unsolved to this very day, but Clara Bauerle is no longer one of the options. She passed away in Berlin on 16 December 1942. The story, as told on this segment, is a mish-mash of different rumours and speculations, many of which have no basis in fact. There is also no direct reference to Josef Jakobs in this segment, nor a copy of the photograph that I sent Optomen. However... during the part where the narrator notes that "she never arrived and many assumed that the mission was aborted and that she never left Germany", there is a short vignette of a man apparently being interrogated. Presumably this is Josef being interrogated by an MI5 officer about Clara Bauerle. On the whole, the segment consists of amateurish recreations and the pieces with "Allison Vale" are particularly comical as she conducts "archival research" with random bits of paper in front of a desktop computer. For those interested in my research on Clara Bauerle, check out this blog post. At the bottom of the post, I have listed all of the blogs (up to that point), that dealt with Clara and her connection to Josef and the poor woman in the Wych Elm. 2/5 - The inaccuracies and amateurishness of the recreations don't warrant more than this.